The balanced application of mineral nutrients is the key for best plant growth. And that is exactly what our game Nutriball is all about! 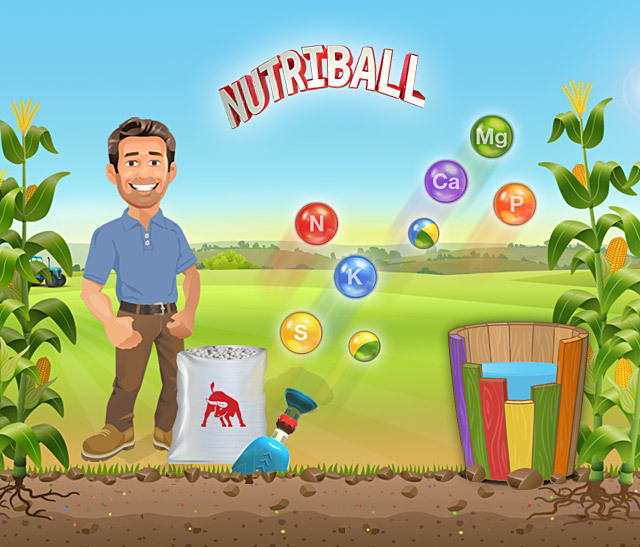 The game is about fertilising corn plants with the nutrients they lack by bursting nutrient balls – the Nutriballs –. To prevent any nutrient shortfalls, all the Liebig barrel staves have to be filled up. If you manage to do that, yield and quality of the plants are assured and farmer Kyle is happy. As a reward, you can enter the points you earned into the high score section. Help farmer Kyle and make sure his corn plants are well supplied with nutrients! The Liebig barrel and the target level table shows which nutrients are lacking. The goal is to: remove the number of nutrients indicated on the board at each level. Use the nutri-cannon to prevent the dropping Nutriballs from reaching the wooden bar at the bottom. The game can be played on a computer with a mouse or simply by touching your tablet or smartphone. On a computer, you can move the nutri-cannon into the desired direction and, with a mouse click, shoot the Nutriball in order to create groups of at least 3 nutrients. In this way, the Nutriballs will explode and the nutrients are then dropped onto the soil. On a smartphone, you can simply tap on the area where you would like to shoot the Nutriballs. What is special about Korn-Kali or ESTA Kieserit Nutriballs? They can be combined with the nutrients they contain. If you shoot two yellow sulphur and two green magnesium Nutriballs after an ESTA® Kieserit joker, the adjacent combination of three balls will explode. You can also use a Nutriball joker as a central nutrient combination (three or more). The Korn-Kali® joker can be additionally combined with a blue potassium Nutriball. Several jokers can explode in combination. Have fun applying our fertilisers and good luck! * The mineral fertiliser Korn-Kali® also includes the beneficial element sodium (Na). wish to advise you as follows with regard to how we will process what data of yours. Our data privacy officer is available to assist you with any questions you may have Phone: +49 5619301-2404, E-Mail: datenschutz-kali-gmbh@k-plus-s.com. If you have any questions concerning the supplementary data privacy declaration, please contact datenschutz@ad-artists.de. This supplementary data privacy declaration contains some information regarding our online game “Nutriball” that supplements our general data privacy declaration. We ask you to inspect our general data privacy declaration first and then the supplementary data privacy declaration for our online game “Nutriball” . The competition serves several purposes. When the game is used, user data is collected to optimise the offering. This is done on the basis of section 15(3) of the German Telemedia Act in conjunction with point f of article 6(1) of the General Data Protection Regulation (GDPR). If you participate in the online game “Nutriball,” your data will be used for the purposes of concluding an agreement on the basis of point c of article 6(1) GDPR. The responsible person within the meaning of the GDPR and the service provider within the meaning of the German Telemedia Act is K+S KALI GmbH. For more details, please view the imprint and the service provider identification on our web page. The IP number is the global unique identifier of each Internet end user device. It serves as an address to which data is sent to the device from the Internet, e.g. our homepage image. If an IP number is not recorded, our web pages would not be able to respond to your inputs and queries and would not be able to communicate with your device. Data on an information visit is only saved for statistical purposes, to optimise our Internet presence and for system security. It is sufficient for such data to be saved in anonymised form: In particular, IP numbers and the Internet address of the site you visited before our site are only stored in abridged form; it is not possible to identify individual users. We never undertake to combine the IP number and the Internet address of the page from which you visit us with other data sets. We do not compile any user or behavioural profiles or similar for visitors who only visit our website for information purposes. If you want to participate in the online game “Nutriball” and be included in the high score section, we also need personal data from you, namely: a nickname. By participating in the online game “Nutriball”, you permit us to use certain data for stage the same (use of nickname entered for the high score section). Should it prove necessary to transfer your personal data to third parties for the purposes of supplying our services or as a result of processing requirements relating to organisational factors, we will always only supply such data as it is absolutely necessary for a specific purpose. Such third parties are also bound by statutory data privacy provisions and required to observe confidentiality. Service companies that are contracted to work for us are not regarded as third parties within the meaning of the preceding paragraph under the GDPR. They are bound to observe statutory data privacy provisions and confidentiality; in addition, by working for us, they are required to follow our instructions. Insofar as there is no statutory obligation to store data temporarily, once the campaign ends and the game is provided offline, all the personal data saved in connection with the game will be destroyed. Your data will be stored for the duration of the performance of the contract, e.g. until the end of the campaign. The online game “Nutriball” includes plugins for social media networks such as Facebook, Twitter, Pinterest and Xing. With the help of these buttons, you can share the game with other platform users on the respective channels. The buttons are purely graphic links that link to the corresponding social networks and plugin functions. A connection with a social platform is only set up if the share button is actively accepted. In this way, we use state of the art technology to comply with data privacy rules. If you want to find out more about the data privacy guidelines following individual social platforms, please visit the respective sites. We reserve the right to amend this data privacy declaration in the future. We will notify you of any such amendments.